Visual QuickStart Guides are now even more visual: Building on the success of the top-selling Visual QuickStart Guide books, Peachpit now offers Video QuickStarts. As a companion to this book, Peachpit offers more than an hour of short, task-based videos that will help you master Mac OS X Lion’s top features and techniques; instead of just reading about how to use a tool, you can watch it in action. It’s a great way to learn all the basics and some of the newer or more complex features of the operating system. Log on to the Peachpit site at www.peachpit.com/register to register your book, and you’ll find a free streaming sample; purchasing the rest of the material is quick and easy. 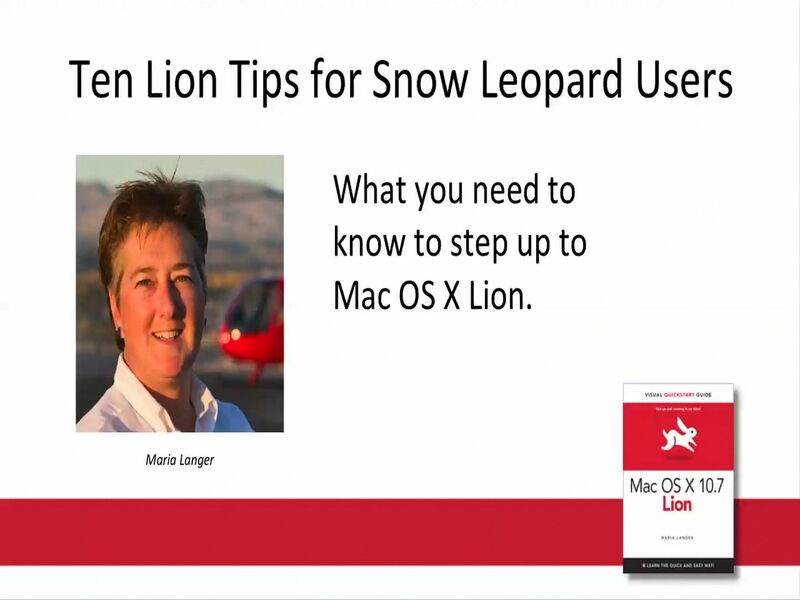 This video will have you up and running in no time with Mac OS X Lion. Respected, bestselling author Maria Langer will take you through Mac OS X Lion's groundbreaking new capabilities and features, including Multi-Touch Gestures, Launchpad, Mission Control, the App Store, Mail, and much more. This effective tutorial is packed with practical information for people who want to jump in and start working and playing with OS X Lion.